From today onwards we’ll be presenting to you the progress of AFAS Stadion reconstruction. This was possible thanks to the amazing help of Paul Martin, who visits the site every day, and Pol van Heuwert, who provides us with valuable updates from Belgium and the Netherlands. To both of you, Gentlemen, many thanks! Now for the stadium: we’ve already shared our amazement with how fast it’s being built last year, when the new north stand was built in just over 3 months. Yes, that’s the entire curved, double-tiered grandstand delivered within weeks. Why the rush? KV Mechelen is largely funding the stadium on their own and limiting losses during constant use is vital. That’s why construction began just after the 2015 season and lower tier of the north stand was opened to the public already in September last year. The entire stand was operational by November. In the latest photo gallery and those in weeks to come, you’ll see progress on the next grandstand, along the western end of the field. It may be shorter, but it also houses all of the skyboxes planned, as well as office space (1,000 square meters already rented by Telenet) and a nursery. All of these facilities should be delivered in June, pending full operational status in the 2016/17 Jupiler League season. 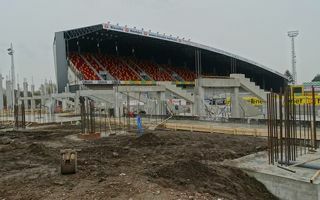 At which point all that’s left to deliver will be the club’s offices, but in this singular case KV Mechelen aren’t going to rush things. First, proper access routes to the two new stands have to be created. In the end, in 2017, the Belgian club will have a very distinctive stadium with two stands built from scratch. Capacity at 18,500 with largely upgraded amenities will come at a cost of roughly €8.5 million. Not a bad deal at all!